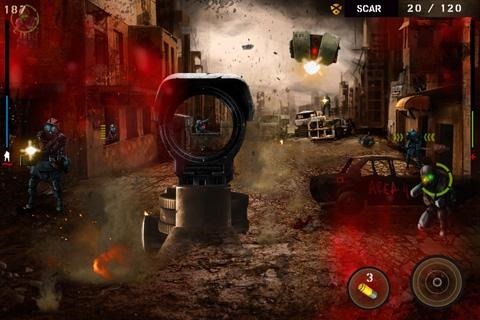 Overkill Shoots Its Way To Android – Download Now! Earlier today, we saw one of iOS’ best racing simulation games ported over to Android and now, another popular iOS game – Overkill – has been released on Android. Check it out after the jump! Developed by Craneballs Studios, Overkill is an intense first-person shooter. 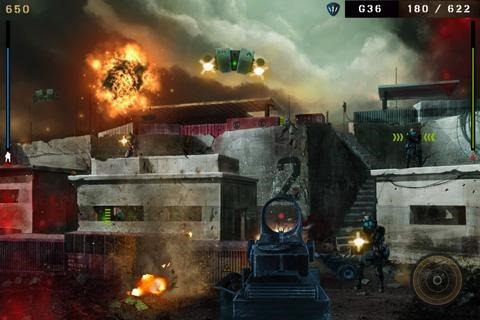 You are placed in a battlefield and ordered to kill every enemy you come across using one of the 14 weapons. Each enemy you kill gets you bounty, which you can use to purchase upgrades or unlock new weapons. Because you cannot actually move, the controls are pretty simple: you aim your weapon with your left thumb, shoot with with your right and reload by shaking your device. Civilized society has collapsed and you have been hired as a mercenary with a mission to kill all you cross. On the Battlefield use an array of increasingly powerful weapons (AK-47, M4, SCAR, RPG, P90) to eliminate anything that stands in your way. A bounty is paid for everything that is killed and destroyed, and with the reward you can buy weapons or upgrades. We’ve tested the game on a Samsung Galaxy S II on Android 2.3.3 Gingerbread and can confirm that it works as advertised. To be very frank with you, I’m not at all a fan of intense games on touchscreen devices. With heavy use, the screen gets warmer and warmer (which increases friction) until it just becomes unpleasant to touch the screen. I do, however, know plenty of people who love these sort of games and so, if you are fan of first person shooters, you should definitely check Overkill out: it is one of the most popular first person shooters on iOS, and the port to Android is exactly the same! If you’re interested, Overkill can be downloaded for free from the link embedded below. Certain weapons and upgrades are locked, and they can be unlocked by sharing Overkill with friends via email/Facebook or as an in-app purchase. Be sure to let us know what you think of it in the comments section over on our Facebook page!